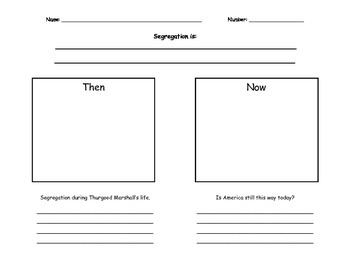 I use this sheet when talking about Thurgood Marshall and the segregation he fought to change. I have students discuss segregation and even separate the boys and girls and take turns only calling on one or the other. They then dig into their books to find segregation that Thurgood fought to change (such as Brown v BOE) They describe what it was like and illustrate for back then and then write what has changed and illustrate how it is now without segregation.